These are organisations who are passionate about the work of critical and emergency control rooms, and who want to publicly recognise their contribution to keeping our communities safe. The event would not be possible with the support of these key partners, which is why we want to thank them all for their generous support. Leading UK intelligent transport solutions and network maintenance provider, telent is the Platinum Sponsor for the Control Room Awards. Barry Zielinski, telent’s General Manager, Public Safety & Defence, said: “we're proud to be named as the platinum sponsor of the first Control Room Awards. We are delighted to be able to recognise and celebrate heroes within the emergency services and the life changing work of mission-critical organisations. The British Association of Public Safety Communications Officials (British APCO) is backing the Control Room Awards as a primary partner. A not-for-profit, membership organisation, British APCO is the leading UK-based association for everybody who uses public safety communications and IT. Launched in 1993, British APCO works to increase public safety by the development of technology and sharing of ideas throughout the public safety and critical communications community. Bronze Sponsor of the awards is West Pier Telecom, the award-winning provider of communications and networking products and a key reseller of Avaya multi-site and contact centre solutions. Recognised as an innovative, forward-thinking company for over twenty years, West Pier Telecom delivers excellent services to customers from the smallest organisations to multi-national enterprises and government bodies. Red Box, which will sponsor the Team of the Year category, records communications across control and incident rooms and workers in the field, enabling the verification of important details and the reconstruction of events for evidence gathering. With offices in London, New York, Singapore and Hong Kong, Red Box has a long history of working with the police, fire and coastguard services, along with other safety-focused organisations such as in the transportation and construction industries. Sponsor of the Dispatcher of the Year award, Plantronics creates premier audio and collaboration experiences for smarter working and better living. Plantronics technology creates rich, people-first collaboration experiences so good ideas can be shared and heard—wherever, whenever and however they happen. Over 55 years’ of audio and collaboration innovation is embedded into every product, with a portfolio of integrated solutions spanning headsets, software, desk phones, audio and video conferencing, and analytics and services, providing partners and customers with the tools and technologies they need to create and offer the most focused and distraction-free environments. Sponsor of the Young Achiever of the Year award, Sopra Steria has a long heritage of delivering control room solutions to the emergency services. Trusted by leading private and public organisations to deliver successful transformation programmes that address their most complex and critical business challenges, Sopra Steria combines high quality and performance services, added-value and innovation. 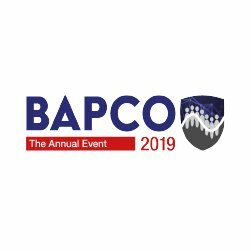 Sponsor of the Lifetime Achievement Award, the BAPCO Annual Conference & Exhibition is a crucial event for everyone that is involved in public safety solutions. For the very first time it will take place in conjunction with TCCA's Critical Communications Europe, (CC Europe) at the Ricoh Arena, Coventry, UK, from the 12-13 March 2019. Alongside a plethora of the latest technology and solutions from top suppliers and expert led conference sessions on the latest topics, BAPCO with CC Europe 2019 promises to be a must-visit conference for anyone in the public safety and critical communications sectors, and in particular, those from the control room. Sponsor of the Call Taker of the Year award, The Emergency Services Times magazine is proud to support public safety professionals around the world. Alongside its highly regarded magazine, it is also the organiser of The Emergency Services Show - the UK’s leading annual showcase of the blue light sector, featuring over 450 exhibitors, live demonstrations, unique learning opportunities and unrivalled networking. Sponsor of the Leader of the Year award, Affini is a UK based systems integrator experienced in wireless communications and ICT projects. With a wide range of expert consultants, architects, designers, engineers and project managers, Affini is proud to deliver a broad range of solutions and services. Affini operates across a number of sectors including aviation, road, rail, public safety, venues and public buildings, and construction. Hexagon Safety & Infrastructure is sponsoring the Bravery and Courage Award. Hexagon helps organizations overcome obstacles to improve operations and manage change intelligently and effectively. Its people are committed to shaping smart change through the provision of solutions critical to government, defence, emergency services and infrastructure operators. If you’d like to support the Control Room Awards 2019, we’d love to hear from you! Just get in touch below or email us on awards@apdcomms.com.